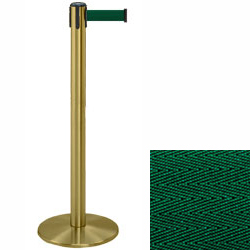 These brass stanchions with dark green belt are great for directing crowds and creating lines in a wide variety of locations. Posts like these can be used in clubs, banks, bars and airports for showing patrons where to go for entrance or service. 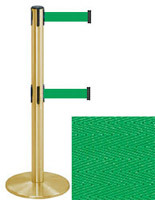 For extra stability, the brass stanchions each have a weighted base for high traffic environments. Each of the posts' belts measures 7.5" long and 2" wide to clearly define a blocked off area. 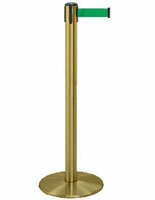 The stanchions with a weighted base are easy to move around restaurants and clubs because they only weigh 24 lbs.